I often watch TED talk videos on my computer while I work out. 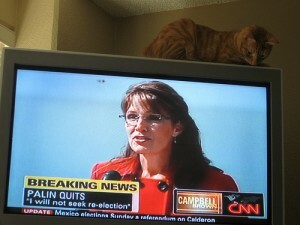 Last night, I watched Sarah Palin’s resignation speech instead. This was not an improvement. Perhaps, it’s not a fair comparison: Palin’s speech was political, TED presentations scientific or artistic. Palin’s an announcement, TED an enticement. Her audience partially hostile, TED’s eager. 479 TED talks are available online. I’ve seen maybe one hundred of them. Each of these speakers has been more effective, in my opinion, at accomplishing these three elements than was Sarah Palin today. Instead, I asked myself what TED speakers do that Palin could have done, whatever her motivation. TED presenters know they’re “on” – this is their 18 minutes to “give the talk of their lives.” And, they do. For some – as for Palin – this is one talk among many. Yet, TED speakers come performance-ready. That means prepared: intention clear, speech crafted and practiced. Palin seemed insufficiently prepared for one of the most significant speeches of her political career. If you can give powerful form to a speech about having a stroke, you should be able to tell a story about choosing to be a governor and now choosing to let that go. Storytellers give us a map to their journey, even if that map is discernable only in reverse. Palin’s speech offered no map. Rather it seemed she cut out snippets from previous speeches and read them in random order. Palin rushed, and the problem is not just speed. Many TED speakers talk blazingly fast (Susan Blackmore on Memes). I suspect difference is intent to engage – TED speakers want us to connect with their message, and they keep us with them through a variety of well-understood rhetorical devices. Despite her eye contact and constant smile, Palin’s hurried speech pounded us with soundbites, rather than inviting us to understand and support her decisions. Coming back full circle to their message, TED speakers call us to action – explicity (Ken Robinson on education) or implicity (John Francis walks the Earth). They’ve sculpted not only messages but ways forward for us to make use of them. Whatever Palin’s message, even her faithful are unsure what she wants them to do in response. Can all this be accomplished in a rapidly-prepared, defensive political speech? Yes. For an example from her own party that succeeds on each of these points, Palin need only review Nixon’s famously effective Checkers Speech (Part 1 Part 2). Do share in Comments below the links to your favorite TED talks and also political and business speeches you consider most effective. Tagged with Politics + Government, speeches, storytelling, ted.